When it comes to Apple products, speculation knows no bounds. We have heard stories of an iPhone 5S, an iPhone 6 and stories of a dual release, where two new iOS 7 powered devices will be released, most likely this September. Today though, T3 have published what appears to be the most compelling Apple iPhone 6 first picture. The attached video also shows a full 3D render of the new iPhone. 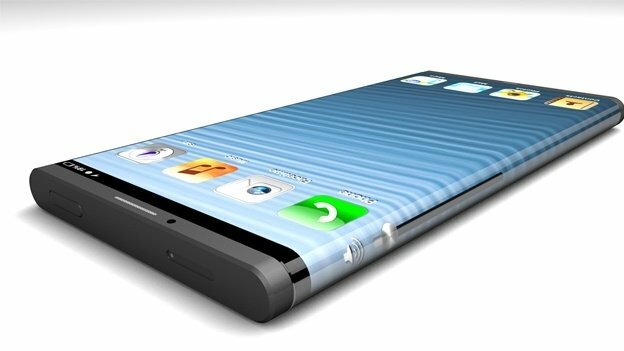 Whether the next Apple Smartphone will be called the 5S or the iPhone 6 is still the subject of wild internet speculation, but what is based on solid fact is an Apple patent for a ‘wraparound smartphone screen’. This patent – which we should note is one of thousands that Apple regularly apply for – could be a real game changer. In a year of hot gadgets the new iPhone sits on the top fo the tree, with huge expectation tied in with a a general acceptance that Apple needs to get this one right on the back of Samsung’s rapid emergence to market leader. This patent opens up some interesting options, if as expected, Apple are incorporating it into the designs for their next smartphone. For a start, it could bring to an end the classic Apple physical buttons, including the home button, mute button and volume controls. I have always been a big fan of those buttons, especially the brushed alumium styling on the mute and volume buttons, but there’s a general feeling that the 2013 iPhone will look radically different. We haven’t had a big design overhaul on the iPhone since the iPhone 4. The 4S was visually identical, and the 5 was merely an elongated model of the previous two generations. With the iPhone 5, Apple demonstrated a willingness to play with the iPhone’s dimensions. It will be interesting if they choose to use this wraparound design in order to deliver a device with an effectively bigger screen, but within the same dimensions as the 5. The wraparound screen design is said to deliver a screen which, through its rolled and unrolled design, delivers effectively twice the size. So whatever Apple are planning, it is definitely set to be different. With the totally new iOS – designed and implemented by a new man after Apple Maps-gate – this device is set to take on a more android-like feel.